Rhododendrons, many species of which offer showy displays of large blossoms, are the state flowers of West Virginia and Washington state. There are both evergreen and deciduous species of rhododendrons; they grow as shrubs and sometimes as small trees. The proper time to prune them depends on the nature of the problem and the goals of the gardener. As a general rule, rhododendrons are pruned early in the spring after the last frost so the cuts have time to heal. 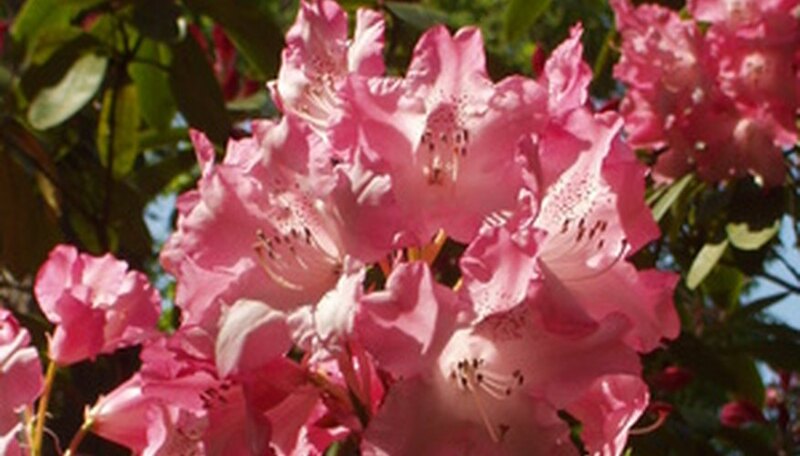 Pruning rhododendrons after they start growing will inhibit blooming. Pruning a rhododendron lightly while it is flowering or just after it has flowered will not affect the formation of flower buds the next year. Rhododendrons may also be pruned in the late winter when they are dormant. Rhododendrons begin to grow every spring at a visible spot called a growth joint, a bud or branch that is growing outward. Prune just beyond growth joints. Do not prune between the joints; there are no dormant growth buds there. Make the pruning cuts at an angle so water will run off easily. Paint cuts larger than 1 inch with grafting wax or pruning seal. Fertilizing rhododendrons after they are pruned may result them growing tall and spindly, what is called “leggy” growth. If a young rhododendron is leggy, pinch the terminal leaf buds in the spring. This will force dormant buds to grow, producing multiple branches. Take care not to pinch the flower buds that are fatter. If an older plant is leggy, prune farther down the branch. Find a latent leaf bud under the bark. This will be in the form of a ring of bumps. Prune just beyond it; new shoots should appear from the new end of the branch. Removing clusters of withered flowers after the blooming season is a form of light pruning called dead heading. This is not necessary with rhododendrons that produce small flowers. Prune branches that are diseased, dying or dead any time; prune them flush with the main branch or trunk. Prune branches that are dragging on the ground or that are touching a fence or building. Prune rhododendrons so you have space enough to walk around them to take care of them. A good time to do this is late in the winter. Prune branches that cross one another. If large rhododendrons are too thick at the top, sunlight can't get in and they may develop diseases; the tops can be thinned using a ladder. This pruning can be done after rhododendrons have finished blooming. Prune the lower branches of large rhododendrons if sunlight is scarce; the lower branches don't have many leaves and do little for the plant's appearance. It's easier to lay mulch around the base of the plant with those branches gone. This too can be done after the rhododendrons have finished blooming. A rhododendron that has been severely pruned to where there are stumps with no leaves may not produce blossoms for two or three years. Massive pruning should be spread over two or three years to avoid shocking the plant.